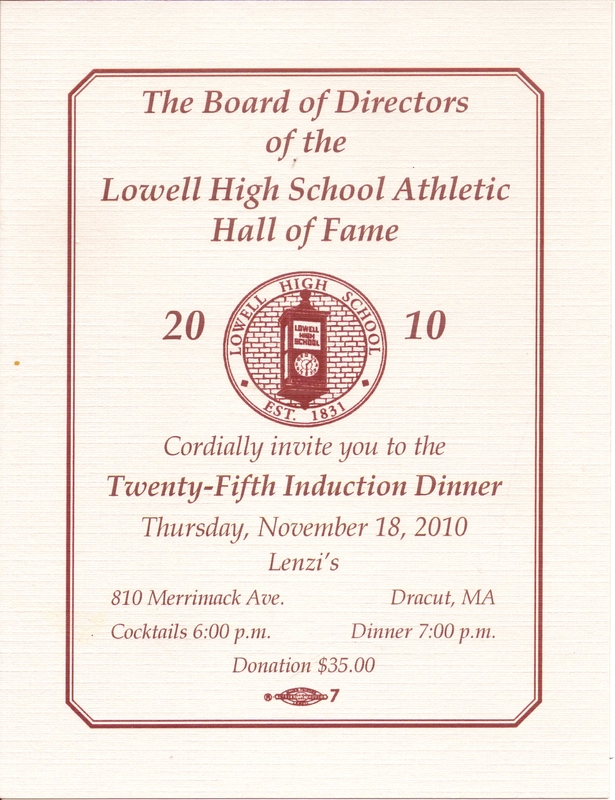 DRACUT — His is among the names seemingly synonymous with Lowell High athletics. One simply assumed Walter Nelson was already a Lowell High Hall of Famer. But the official coronation came last night at Lenzi’s Mill House Restaurant. Nelson, leading scorer on Ray Riddick’s final Lowell High football bowl team in 1961, who succeeded the great coach 15 years later, was enshrined into the LHS Hall of Fame with its 25th class of inductees that also included Jim Ciszek (Class of 1942), Joe Miller (’73), Gail Reynolds (’83) and Brian Durkin (’98). “Lowell High has been very good to me,” said a smiling Nelson (’62), a former three-sport standout who coached LHS football from 1976-88, later was athletic director, and still mans the clock and scoreboard at Cawley Stadium on Friday nights. Seven football players from Nelson’s time as LHS’ head coach already were in the Hall of Fame. Nelson also joins his younger brother Brent (’65), a 1988 inductee. More important than the X’s and O’s of athletics that coaches like Riddick, Mike Haggerty, Al Mangan and Stan Stoklosa taught him, said Nelson, 66, was the strong sense of Lowell High history and tradition. This continuous stream of pride, which flows generation to generation, wound through these 25th proceedings, which included video highlights of past heartfelt induction speeches. Reynolds, an LHS swimming pioneer who excelled also in track and field, deftly wove a “Field of Dreams” theme through an acceptance speech certain to make future highlight reels. One scene included Gail and her late father Brian, a 1988 inductee, as 17-year-old LHS students out at Cawley Stadium discussing high-jumping techniques amid all the other the LHS legends, eternally 17 and running in sunshine. “It’s nice to be home. It’s nice to be back in Red and Gray,” said Reynolds, who moved away 23 years ago, and lives in Tampa with her husband Gary, an attorney, and their daughter Sarah, 8, and son Ryan, 6. Her married name is Gail Frank. During February of her senior year at LHS, Reynolds underwent kidney surgery, but returned late in the spring track season to finish sixth in the high jump at the EMass. Class A Championship Meet. She needed surgery this week for an infection in her left ear so she could fly home for last night’s dinner. The 25th annual dinner became the first at which hockey and golf stories were told. “I know these sports are foreign to a lot of people here,” cracked Miller, 54, the first to be inducted into the LHS Hall for his prowess in those sports. Miller starred on Lowell High golf and hockey teams that complied an overall record of 78-7-7. As a senior defenseman in 1972-73, he scored 17 goals and added 13 assists. In golf, Miller finished 14th and eighth in the state individual championships as a junior and senior, respectively. He won the City Golf Tournament in 1973 and 1975. Durkin said he was driven to succeed while trying to live up to his older brothers, Mick and Joe, also both LHS swimmers and baseball players. Durkin ranks fourth all-time at LHS in batting average (.411), hits (81) runs (64) and home runs (7). He won the John Beaulieu Valedictory Award as LHS’ outstanding male athlete in the Class of 1998. Durkin went on to star in baseball at Boston College. Durkin, 30, is a personal-injury attorney in Lowell, whose wife Julie is the daughter of Mayor Jim Milinazzo. Ciszek, best known as athletic director at UMass Lowell (then ULowell) from 1979-87, lettered in football, basketball, baseball and track at Lowell High. But he suspects his induction is due to helping establish the LHS Hall of Fame, including serving as the first chairman of the selection committee. Ciszek is a member of three other Halls of Fame: UMass Lowell, National Association of Collegiate Directors of Athletics, and Massachusetts Chapter of the National Football Foundation.